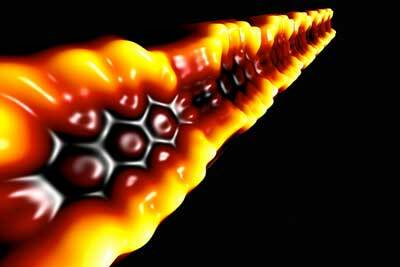 (Nanowerk News) Scientists are experimenting with narrow strips of graphene, called nanoribbons, in hopes of making cool new electronic devices, but University of California, Berkeley scientists have discovered another possible role for them: as nanoscale electron traps with potential applications in quantum computers. Scanning tunneling microscope image of a topological nanoribbon superlattice. Electrons are trapped at the interfaces between wide ribbon segments (which are topologically non-trivial) and narrow ribbon segments (which are topologically trivial). The wide segments are 9 carbon atoms across (1.65 nanometers) while the narrow segments are only 7 carbon atoms across (1.40 nanometers). 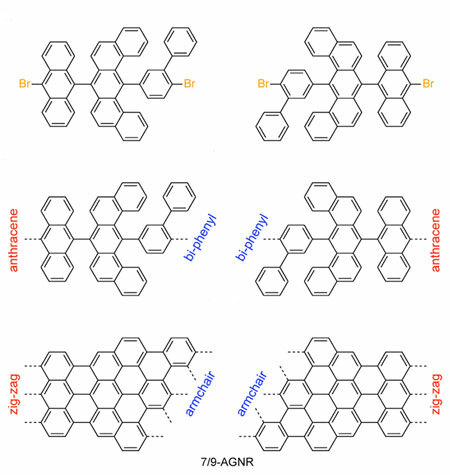 The researchers report their synthesis, theory and analysis in the Aug. 9 issue of the journal Nature ("Topological band engineering of graphene nanoribbons"). Louie, Fischer and Crommie are also faculty scientists at Lawrence Berkeley National Laboratory.